This PDF 1.6 document has been generated by Adobe InDesign CS5 (7.0.4) / Adobe PDF Library 9.9, and has been sent on pdf-archive.com on 21/10/2016 at 16:49, from IP address 165.225.x.x. The current document download page has been viewed 198 times. INTROSPECTIVE AND APPRECIATE INTELLECTUAL DISCUSSIONS. in many directions. People with strong Intellection talents are introspective. This introspection gives them time to reflect and ponder. Wherever it leads them, their mental hum is a constant in their lives. 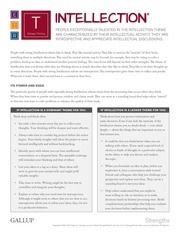 The particular genius of people with especially strong Intellection talents stems from the processing that occurs when they think. to discover new ways to solve problems or enhance the quality of their work. Think deep and think often. thoughts. Your thinking will be sharper and more effective. forward intelligently and without backtracking. will stimulate your thinking and that of others. crystallize and integrate your thoughts. •• Explain to others why you need time for introspection. sounding board to test your ideas. your decisions before implementing them. This file has been shared by a user of PDF Archive. Document ID: 00497565.